Making sure your money is safe and secure is the underpinning of investment decisions. Make sure your exchange accommodator is insured as well as being a 1031 exchange expert. David Moore of Equity Advantage explains how to check on your accommodator’s expertise and insurance. 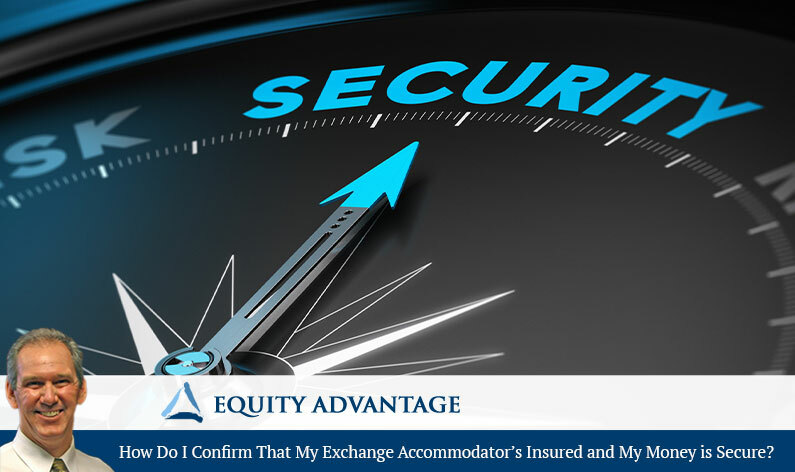 How do I confirm that my exchange accommodator is insured and my money is secure? This is obviously an important question to ask, because saving tax doesn’t do you much good if your money is not safe. Anyone reputable in the business is going to be part of the Federation Exchange of Accommodators, which has a code of ethics. You have to have bonding and E&O. So the easiest way to find out is just check to see if they’re a member of the Federation of Exchange Accommodators (www.1031.org) and then you can ask your accommodator for a copy of their fidelity bond and whether they have E&O also. Those two things are what you want to confirm. If you’re really concerned about securing funds, the size of the company is relevant. You can use what’s called a qualified escrow account and that isolates funds from the accommodator as well as you, so you wouldn’t have actual or constructive receipt of the funds. This takes care of everything and it’s been around forever. You can also call them a semi-federate account, and that will typically take care of you. It’s wise to pay attention to the safety of your funds. So first, look for bonding, then look to the FEA for membership, and then, if all of that is not enough, you can always ask for a qualified escrow. How can I tell if the accommodator is a 1031 exchange expert? I would say that there are people that are experts in paperwork. There are people that are experts in application, and if you look at 1031, we’ve always said that is not a tax, legal, or escrow decision, it’s an investment decision. You do it for one reason: To keep your money yours and move forward with it. if you are looking at exchange expertise, what are you looking for? If you’re looking for a company that is going to help you find solutions to your problems, then that is definitely going to be a different entity than somebody who is going to act as an accommodator and accommodate your transactions. In other words, there are facilitators and there are accommodators. A facilitator takes an active role; he will make things happen. An accommodator accommodates and if you have an exchange that is a simple straightforward deal, they can handle the paperwork and take care of you. Can An Exchange Accommodator Tell Me How An Exchange Will Affect My Heirs?